60-Minute Special In Color On Videotape. Original Air Date: NBC Television Network, Monday, April 14, 1969, 8-9 P.M. (EDT). Micky Dolenz & Julie Driscoll: �I�m A Believer�; Peter Tork: �I Prithee (Do Not Ask For Love)�; Michael Nesmith: �Naked Persimmon (The Only Thing I Believe Is True)�; David Jones: �Goldilocks Sometime�; The Monkees: �Wind Up Man�; �Darwin�; Paul Arnold & The Moon Express: �Only The Fittest Shall Survive�; The Monkees: �I Go Ape�; The Trinity: �Come On Up�; The Monkees: �At The Hop�; Fats Domino: �I�m Ready�; Jerry Lee Lewis: �Whole Lotta Shakin� Goin� On�; Little Richard: �Tutti Frutti�; We Three & The Monkees: �Shake A Tailfeather�; Fats Domino: �Blue Monday�; The Monkees: �Little Darlin��; Jerry Lee Lewis: �Down The Line�; The Clara Ward Singers: �Dry Bones�; David Jones: �String For My Kite�; Peter Tork: "Solfeggietto" by C.P.E. Bach; The Monkees & Entire Cast: �Listen To The Band� ; Peter Tork: �California Here It Comes� (End Titles). To twist the mind to any lunacy we wish. Through this Electro-Thought Machine, I'll demonstrate exactly what I mean. And through the latest fad of rock and roll, conduct experiments in mind control! On an unsuspecting public they'll be turned! I'll brainwash them, and they'll brainwash the world!!!! A psychedelic Svengali-esque Wizard (Brian Auger) and his zombie-like assistant (Julie Driscoll) along with a gorilla plots an insidious course to take The Monkees through various stages of evolution through mind control in order to brainwash the world via commercial exploitation. First, with his Electro-Thought Machine, he has The Monkees appear in his quarter in giant test tubes. Then through mind control, he strips them of all personal identity and names: Micky Dolenz becomes Monkee #1, Peter Tork becomes Monkee #2, Michael Nesmith Monkee #3, and David Jones Monkee #4. Next, The Wizard attempts to have them perform together and turning on the machine The Monkees sing a speeded-up/slowed-down rendition of their theme song; then he switches off the power to stop them and declares them all in his power. In his absence, The Wizard�s assistant tells them to regain their stripped personal identities by thinking their way out of captivity into their own world of fantasies, and soon Each Monkee�s spirit rise out of his body. Monkee #1 (Micky) performs an R&B up-tempo duet remake of �I�m A Believer� with Julie Driscoll; Monkee #2 (Peter) reclines on a giant cushion in eastern garb and, to the lilting backing of sitar and tabla, performs �I Prithee (Do Not Ask For Love)�, a gentle number concerning spiritual values; Monkee #3 (Michael), in an inventive splitscreen number, sings a country tune, �Naked Persimmon (The Only Thing I Believe Is True)�; and Monkee #4 (David) capers about in short pants and frill collar in fairytale land with such female fairytale icons ans Goldilocks, Little Red Riding Hood and others, singing and dancing to the tune of �Goldilocks Sometime�. But The Wizard after observing their fantasies declares each of them with fixation, withdrawal, schizophrenia and regression and then proceeds to continue brainwashing. Then The Monkees are all in costumes in front of a giant tape recorder performing �Wind Up Man� as stiff-legged robots. Interrupted again by The Wizard who isn�t satisfied with the performance attempts to teach them another song with pianos all on top of one another, he plays a 1950s tune along with Jerry Lee Lewis, Little Richard and Fats Domino on each piano (stacked on each other!) until evolutionist Charles Darwin himself interrupts, himself dissatisfied with the proceedings and tries to redo from the beginning by having The Monkees sing a brief tune �Darwin� before breaking them down by his own hypnotism via "Only The Fittest Shall Survive," a slab of swirling psychedelia laden with congas, drums, jungle noises, cyclonic winds, explosions and heavy breathing. Next, Darwin introduces his latest masterpiece of evolution which has The Monkees now dressed in white gorilla costumes performing the hit tune �I Go Ape� along with a group of gorillas. With The Monkees all caught in a net, Julie Driscoll performs the song �Come On Up�. Then The Monkees are regenerated to Darwin�s taste and having them hypnotized, plasticized, psychoanalyzed and sterilized he introduces them as the �greatest rock n� roll singers in the world� at The Paramount Theatre on December 7, 1956. Soon all dressed in 1950�s wardrobes, they emerge from a large birdcage (! ), on the stage and perform classic 1950�s tunes �At The Hop�, �Shake A Tail Feather� and �Little Darlin�� with the group We Three as dancers. Other 50�s icons also appear performing their great hits with Fats Domino singing �I�m Ready� and �Blue Monday�, Jerry Lee Lewis performs �Whole Lotta Shakin� Goin� On� and �Down The Line�; Little Richard �Tutti Fruiti� and �Long Tall Sally� and ends with the Clara Ward Singers doing a gospel rendition of �Dry Bones�. Having demonstrated how society is constantly brainwashed into sameness throughout virtually the whole show, Brian Auger and Julie Driscoll interrupts the proceedings and announces they have decided to give David, Micky, Michael and Peter complete and total freedom, showing how, when people are tired of conformity, they branch off into extreme paths of individualism. Then, on a set cluttered with hundreds of old props resurrected from literally scores of old movies, David Jones performs �A String For My Kite�. Soon Peter Tork arrives and runs through a brilliant harpsichord rendition of "Solfeggietto" by C.P.E. Bach. Then with Michael Nesmith and Micky Dolenz, all four perform �Listen To The Band,� with Michael on Black Beauty (Gibson Les Paul Custom), Peter on keyboards, Micky on drums, and David on tambourine as an affectionate swan song performance by the original Monkees quartet. As the song progresses, they are joined by hippies and all of 33 1/3 Revolutions Per Monkee's guest musicians from The Trinity to The Buddy Miles Express, resulting in a climactic frantic cacophony until until a gorilla literally closes the book on them; the book's title is, prophetically, The Beginning Of The End. As Peter Tork performs �California Here It Comes� (his very last Monkees recording! ), 33 1/3 Revolutions Per Monkee's end credits superimpose over footage of Southern California being the hapless victim of an A-bomb blast. The Monkees went into production on 33 1/3 Revolutions Per Monkee on the day immediately following their very last full concert as a quartet, at The Festival Hall in Osaka, Japan. NBC went on strike just as the 33 1/3 Revolutions Per Monkee cast and crew were about to commence recording, thus forcing them to switch taping locations to Metro-Goldwyn-Mayer's studios, where production was done on the fly through remote trucks parked right outside. This was the first and only Monkees TV project to be captured on videotape, whereas all their previous celluloid endeavours (the TV series and the movie HEAD) were filmed on either 35mm or 16mm. This was done to take full advantage of special techniques and effects which were common to film, but never before used on videotape. Speed-ups and slow-downs and psychedelic color keying were done in New York with available equipment to accommodate the producers. This was the last performance as a quartet The Monkees ever gave. Peter Tork, reportedly suffering from exhaustion, bought out his Monkees contract @ the end of 33 1/3's production, reducing The Monkees to a trio and making 33 1/3, in its initial NBC-TV telecast (pre-empting Rowan And Martin's Laugh-In), look dated! Ironically a full year after this telecast, Michael Nesmith took his final turn as a Monkee, filming a Kool-Aid commercial with David Jones And Micky Dolenz in Palm Springs, CA, before moving on to be the frontman for The First National Band. The Monkees would not be seen on network TV as a foursome again for 28 years. 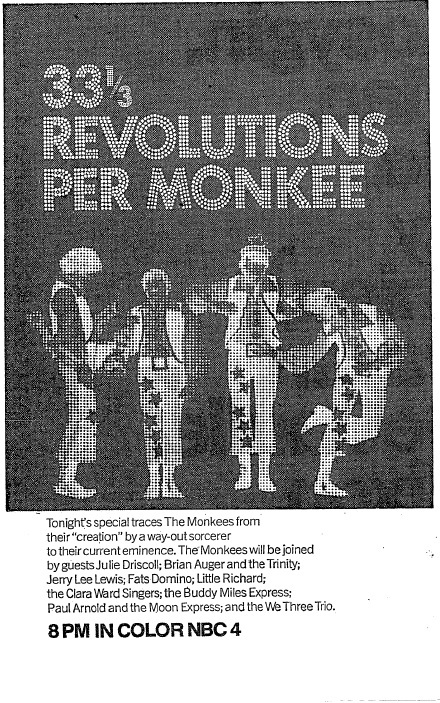 Negotiations were originally made in early 1968 for The Monkees to star in three NBC-TV specials to air in 1969; 33 1/3 Revolutions Per Monkee was the first. When The Peacock Network saw the final edit of 33 1/3, they realized that they had much more than what they bargained for, and sensed it was too subversive for John Quincy Public, hence their decision to air it opposite The 41st Academy Awards Presentation on ABC--on the Pacific coast, anyway. Further damage was done to the telecast by an engineer who accidentally presented 33 1/3 Revolutions Per Monkee out of sequence, making it more confusing than it already was. All this prompted NBC to scrap plans to produce the other 2 Monkees specials. The Hawaiian broadcast of 33 1/3 Revolutions Per Monkee was delayed for 2 whole weeks; it was finally shown there on Monday, April 28. Its telecast in Great Britain occured on Saturday, May 24 on BBC2. Backing tracks for 33 1/3's songs were cut in December 1968 at Western Recorders studios in Los Angeles on 1-inch 8-track tape by noted Producer Bones Howe and then transferred, unfinished, to the 33 1/3 Revolutions Per Monkee soundstage at MGM, where The Monkees dubbed their lead vocals live during the TV tapings. No full studio dubbing of any complete songs ever occurred, and the multitrack tapes were apparently left behind at the MGM studio and assumed lost; only one soundtrack album for 33 1/3 Revolutions Per Monkee had ever been released: Zilch's illegitimate 1984 dub from the audiotrack of a low-quality public-domain copy of the special (MDPM-102). However, a recent excavation has turned up multitrack masters for 8 of those backing tracks ("[I Prithee] Do Not Ask for Love" [1968 Backing Track, Take 12], "I Go Ape" [Backing Track, Take 10], "Wind Up Man" [Backing Track, Take 1], "String For My Kite" [Version 1 Backing Track, Take 1], "Naked Persimmon [Backing Track, Take 1], "Goldie Locks Sometime" [Backing Track, Take 4], "String For My Kite [Version 2 Backing Track, Take 1], and "Darwin" [Backing Track, Take 2]), and they have been featured as bonus tracks on Disc 3 of Rhino Handmade's November 22, 2011 3-CD Deluxe Edition reissue of Instant Replay (RHM2 528791), along with actual tracks from the special ("Naked Persimmon," "Goldie Locks Sometimes," "Darwin" and "I Go Ape"). Another track from 33 1/3 Revolutions Per Monkee, the last, "California Here It Comes," was the only complete tune cut for the TV special, and was plucked from the vaults for inclusion as a bonus selection on Disc 3 of Rhino Handmade's October 26, 2010 3-CD Deluxe Edition reissue of the HEAD soundtrack (RHM2 525670). 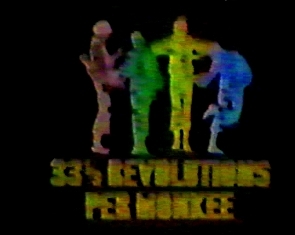 Executive Producer Ward Sylvester was the only member of the original production crew from The Monkees' TV series present for the videotaping of 33 1/3 Revolutions Per Monkee. Bob Rafelson, Bert Schneider, and the production company they formed, Raybert Productions, took the cash The Monkees made for them to produce features, starting with Easy Rider (Columbia, 1969); together with Steve Blauner, another alumni from The Monkees' old soundstage crew, they formed BBS Productions (Bob, Bert, Steve), which churned out such classics as Five Easy Pieces (Columbia, 1970), The Last Picture Show, Drive, He Said (Columbia, 1971), The King Of Marvin Gardens (Columbia, 1972), and Hearts And Minds (Warner Bros., 1974). Mike Murphy's �I Prithee (Do Not Ask For Love)�, which Peter Tork performs in 33 1/3 Revolutions Per Monkee, was previously recorded in an earlier version on November 17, 1966 during a session for the More Of The Monkees album with Micky Dolenz on lead vocals, and was not released originally despite being performed during the group's first tour in Winter 1966/67. The first version remained unreleased until 1990, when it became part of Rhino's Missing Links Volume 2 (R2 70903); a similar, yet different take of �Do Not Ask For Love� can be heard on Rhino's 2001 Monkees Music Box (R2 76706). The rendition of Boyce & Hart's �theme from (THE MONKEES)� heard in 33 1/3 Revolutions Per Monkee is in actuality the stereo mix imperfectly blended into a singular monophonic channel. Jerry Lee Lewis previously starred as Iago in a Jack Good stage production, Catch My Soul, which was a rock and roll version of the Shakespearean classic, Othello. Collector's Note: Rhino deleted Lewis's performance of "Whole Lotta Skhakin' Goin' On" in 33 1/3 Revolutions Per Monkee on Rhino Handmade's limited-edition, July 8, 2016 10-BluRay DVD set, The Monkees - The Complete Series (BD2-552705), due to publishing issues. 33 1/3 Revolutions Per Monkee's East Coast competition was The Avengers [the second half of the episode "Take-Over"] and Peyton Place on ABC, and the second half of Gunsmoke (which guested Monkee guest Dub Taylor ["Hillbilly Honeymoon" (a.k.a. "Double Barrell Shotgun Wedding")]) and Hello Lucy on CBS. Both coasts had 33 1/3 sandwiched between I Dream Of Jeannie (the episode "Jeannie And The Secret Weapon," which featured Monkee guest alum Ron Masak ["The Monstrous Monkee Mash"]) and The NBC Monday Night Movie (Blindfold [Universal, 1966]). Singer Julie Driscoll gained her own fame singing the main title theme from Absolutely Fabulous. The Monkees were none too happy with Jack Good and Art Fisher's script for 33 1/3, calling it "too sloppy, too fairy-tale like," while David Jones felt that, for a TV special starring The Monkees, it emphasized more on its guest cast than the group itself! Director Art Fisher, who collaborated with Jack Good writing 33 1/3 Revolutions Per Monkee, was a former staff director for WNFW-TV who came to the attention of Executive Producer Ward Sylvester and Good as a result of his direction of The James Brown Special for Metromedia television. This was Fisher's debut vehicle for network television. In the �Wind Up Man� sequence, The Monkees wear costumes almost similar to those which they wore in the TV series' pilot film. In his �I�m A Believer� duet with Julie Driscoll, Micky Dolenz wears the same attire he wore in the number for �Goin� Down�, whis was seen in the inset of Monkees episode No. 42, "The Wild Monkees", and at the outset of Monkees episode No. 45, "The Monkees In Texas". For the �Listen To The Band� climax, Jack Good sent a couple of buses down to Sunset Strip to round up about 100 hippies (free people!) to compromise a live audience. Monkee guest Rip Taylor ("The Monkees On The Wheel", "Mijacogeo" [a.k.a. "The Frodis Caper"]) can be seen in a cameo during the �Listen To The Band� sequence. February 1969, 2 months before the airing of 33 1/3 Revolutions Per Monkee, saw the release of "Teardrop City" b/w "A Man Without A Dream" as The Monkees 9th single (Colgems #5000) on the 8th, and The Monkees' 7th album, Instant Replay (Colgems #COS-113) on the 15th...both the first to be released without Peter Tork. �Listen To The Band,� which The Monkees performed in the special, was issued on the A-side of their 10th single, b/w "Someday Man" (Colgems #5004), on April 26, 1969, a full 12 days after its telecast. Micky Dolenz can be seen wearing the same tablecloth he wore in several of the musical numbers The Monkees filmed for their TV show (those which were made for "No Time," "Randy Scouse Git," and "Love Is Only Sleeping."). Peter's soon-to-be wife, Reine Stewart is seen in 33 1/3 Revolutions Per Monkee, as the girl drummer sitting next to Jerry Lee Lewis. David Price can be seen playing drums during The Monkees' performance of "Little Darlin'." In the 1990s, 33 1/3 Revolutions Per Monkee was released commercially by Rhino Home Video in 2 different versions. The version of 33 1/3 released individually in January 1997 (R3 2284) has been on file for years at The Museum Of Television & Radio in New York City, with good sound quality, a fuzzy picture and the segments in original broadcast order, whereas the version of the special released with the October 1995 Monkees Video Box Set (R3 2960) has a sharp picture, murky sound quality, and the segments running in an alternate non-broadcast order. Rhino failed to locate the original 2-inch monaural first-generation videotape to which 33 1/3 Revolutions Per Monkee was committed, and so they had to rely on two 1-inch NBC-TV broadcast masters with quality so substandard, they featured glitches. Rhino used both masters to concoct something of at least viewing quality.